14 members attended this Gasshuku, led by our own instructors and Sensei Arnold De Beer 7th Dan, from South Africa. 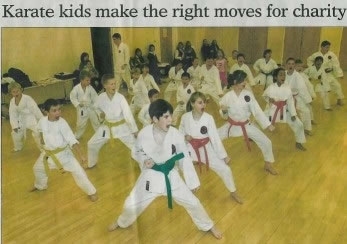 Philip Edwards achieved success in his Black Belt test. Photos and report coming. Do two third Dans getting married make a sixth Dan?? - don't know but we all wish them a happy future. Congratulations Andre and Daphne. If that was not enough, they are off round the world for a year - doing huge amounts of training in every continent. You can follow their adventures here. The GKI is continues to gain in strength, as we held our annual winter Gasshuku in Birmingham led by Sensei Rousseau. A fabulous curry night was held without too many consequences the next day. This was a BIG Gasshuku for our club. We had 11 members training and 4 taking part in the Dan Grading. The Gasshuku was taught by Sensei Rousseau, 7th Dan, Sensei De Beer, 7th Dan (South Africa) and our Sensei Len Sim, 6th Dan. Assisting them were the 5th dans, Senseis Henrieheta Sim, Kevin Nason, Bo Ekstrand and Elias Kattan (South Africa). Sensei Arnold De Beer taught the seniors a Tonfa kata and we will be seeing this practised a lot at the dojo. Members who attended in addition to Sensei Len and Sensei Henrieheta were:- Daphne Birkitt, Andre Leister, Lenny Sim, Peter Fallowell, Robin Edwards, Johnathan Taylor, Philip Edwards, Ben Nash and Dan Bass. Sensei Len assisted Sensei James in teaching at a very well attended Gasshuku. Other club members who attended included Daphne Birkitt, Lenny and David Sim, Robin Edwards, Johnathan Taylor, Ben Nash and Dan Bass. We raised £1,100.00 for a leukemia sufferer, who is a church pastor. Each year we hold a sponsered 2000 techniques in aid of a good cause. Sensei Len taught to a busy Gasshuku in Rimbo, which was also attended by Daphne Birkitt (3rd Dan) and David Sim who achieved his 3rd Kyu at the grading. 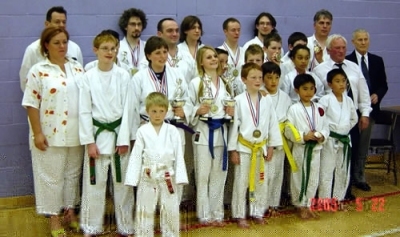 12 medals were won by the eight Wokingham students who attended.